Home » Cake Recipes » Pecan-Topped Coffee Cake – this is a quick and easy coffeecake you can make. Pecan-Topped Coffee Cake – this is a quick and easy coffeecake you can make. This is a delicious coffee cake. This recipe has you making the batter the night before and then cooking this in the morning. This recipe from my grandmother Ethel Eynard. Jefferson City, MO. 1978. You can make a quick and easy coffeecake that has pecans all over the top. Cream butter; gradually add 1 cup sugar and ½ cup brown sugar, beating well. Add eggs, one at a time, beating well after each addition. Stir in vanilla. Combine flour, baking powder, soda, salt, and 1 teaspoon cinnamon. Add to creamed mixture alternately with buttermilk, beginning and ending with flour mixture; mix well after each addition. Pour batter into a greased and floured 13x9 baking pan. 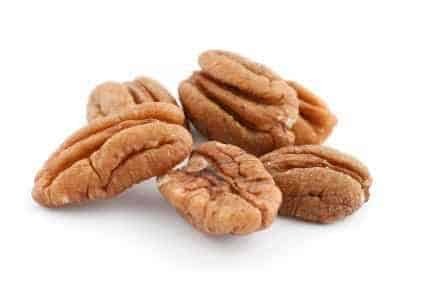 Combine pecans, 1/2 cup brown sugar and 1/2 teaspoon cinnamon; stir well, and sprinkle over batter. Cover and chill 8 to 10 hours or overnight. Uncover batter, and let come to room temperature. Bake at 350 degrees for 35 minutes or until wooden pick inserted in center comes out clean. This is is a great breakfast!